For days since the Boston Marathon bombings, people have been searching for the mysterious “Misha,” the friend with the thin red beard who supposedly tutored bombing suspect Tamerlan Tsarnaev in the ways of more pious Islam. Also hot on his trail was the FBI, which wondered whether “Misha,” described by Tsarnaev family members as an Armenian who converted to Islam, could have known something about Tsarnaev and his brother’s alleged plans to plant homemade bombs at the marathon finish line on April 15. It appears the mystery is over – solved by no less a heavyweight news organization than the New York Review of Books. Acting on a tip from someone who knows the Tsarnaevs, writer Christian Caryl traveled to Rhode Island to interview the man: Mikhail Allakhverdov, 39, who is of Armenian-Ukrainian descent. The FBI had beaten him to to it, having reportedly already interviewed the man described in news accounts all over the world. “I wasn’t his teacher. If I had been his teacher, I would have made sure he never did anything like this,” Allakhverdov told Caryl, who wrote a blog post for the book review. Allakhverdov said he had known the elder Tsarnaev brother in Boston, where he lived until about three years ago, but had not had contact with him since. “I’ve been cooperating entirely with the FBI. I gave them my computer and my phone and everything. I wanted to show I haven’t done anything. And they said they are about to return them to me. And the agents who talked told me, they are about to close my case,” he said. Interest in “Misha” – a common nickname for Mikhail – began when several relatives of Tamerlan Tsarnaev, 26, said the young man had seemed to fall under the influence of a man they could remember only as Misha. 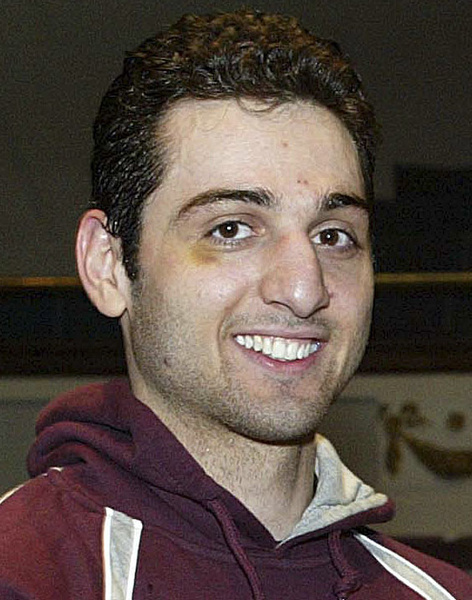 Tamerlan Tsarnaev died in a shootout with police. As outlined in a profile of the two bombing suspects in the Los Angeles Times, the two would talk for hours about religion. Tsarnaev’s mother, Zubeidat Tsarnaeva, said she and her son met Misha at the home of Armenian friends and she saw him as a positive influence on her son. When he moved to another state – apparently Rhode Island – he visited only occasionally. “We were all very sorry that Misha was gone,” she said. “Anzor came in, with Misha sitting there, and said, ‘Who is this person, and why is he still here?’ And the mother said, ‘Back off, back off. He’s teaching your son important things, about life and goodness,’ ” Tsarni related. Allakhverdov’s family told Caryl that they formerly lived in the capital of the predominantly Muslim country of Azerbaijan but left in the early 1990s to escape growing persecution of Armenian Christians there. He confirmed that he had converted to Islam.